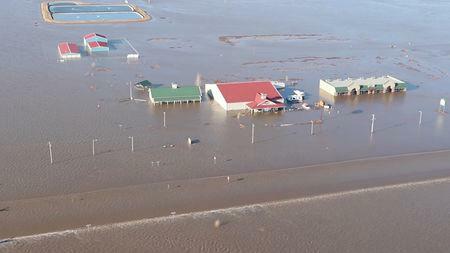 (Reuters) - Climate change played a hand in the deadly floods in the U.S. upper Midwest that have damaged crops and drowned livestock, scientists said on Thursday, while a Trump administration official said more homework was needed before making that link. The "bomb cyclone" that dumped rain on Nebraska, Iowa and Missouri and killed at least four people now threatens a wider region downstream of swollen rivers and smashed levees. Manmade greenhouse gases trap heat in the atmosphere, warming the oceans and making the air above them more humid, scientists said. When a storm picks up and eventually spits out that moisture, it can be devastating for people caught below. "The atmosphere is pretty close to fully saturated, it's got all the water it can take," said Michael Wehner, a senior scientist at the Lawrence Berkeley National Laboratory. Big storms like the bomb cyclone and Hurricane Harvey, which smacked Houston in 2017 with record downpours, are where the impact of climate change can most clearly be seen, he said, adding that climate change's fingerprints were all over the recent storm. "I don't think it's a starring role, but it's a strong supporting role," said Kevin Trenberth, a senior scientist at the U.S. National Center for Atmospheric Research, a federally-funded office, of climate change's role in the Midwest floods. He said the bomb cyclone was carrying vast amounts of moisture from the Pacific up to 1,500 miles (2,400 km) away. Wehner said the flooding was consistent with projections in a government report issued last November, the National Climate Assessment Volume II, that said climate change would boost costs in industries from farming to fisheries and energy production by increasing the frequency of powerful storms. That report, mandated by Congress, was compiled by 13 federal departments and agencies, but was called inaccurate by the White House. President Donald Trump has cast doubt on mainstream climate change science and announced his intention to withdraw the United States from the 2015 Paris agreement, an international accord to fight climate change, saying it is too costly. The White House National Security Council has also been considering the formation of a panel to assess science used in military and intelligence reports, which have angered Trump by concluding climate change poses a national security threat. The White House did not immediately respond to a request for comment about the link between climate change and the storm. Deke Arndt, chief of climate monitoring at the National Centers for Environmental Information, an arm of the National Oceanic and Atmospheric Administration, said that the type of heavy precipitation that immediately led to the upper Midwest floods is generally increasing over time. But trying to link the role of climate change to an individual event is a "fool's errand" akin to trying to determine the cause of a car crash while the wheels are still spinning, he told reporters on a conference call. More research needs to be done to find a definitive answer on climate's link to the floods, Arndt said. NOAA officials said on the call they expect the floods to continue through May and get more dire as snow melts and water continues to flow downstream. Donald Wuebbles, a professor of atmospheric sciences at University of Illinois, Urbana-Champaign, agreed that climate change likely made the Midwest floods worse. But he said that investments in levees and other infrastructure to deal with changes have not kept up, making communities more vulnerable. "People have developed infrastructure for the way the climate was in the past, and haven't really been able to evolve to the climate of now and the future," said Wuebbles.